Click Seed in the menu to seed one or more events. Normal Seeding — Choose Normal seeding to have the system seed based on the standard seeding parameters. Standard seeding parameters will place your fastest swimmers in the middle lanes and seed out to the last lanes on the outside for slower swimmers. Dual Meet using Even-Odd Lanes — If you only have two teams in the meet, you can quickly place them in odd/even lanes by selecting the team to be in the odd lane in the dropdown. Double Dual, Triple Dual etc. — Select this option to open up a screen to place individual teams in specific lanes. You can double click the team to move them into their corresponding lane or drag and drop. Seed Randomly — This option seeds athletes randomly. This is useful, for example, if athletes have no seed times. Identify team in HIGHEST Lane of FASTEST heat for ODD number of lanes — If you have set this meet to have an odd number of lanes, such as 7, then use this function to designate which team in a two-team even/odd setup will be in the fastest heat in lane 7. It will alternate teams from there. Combine/Separate Events — Click to open the Combine Two Events screen. This allows you to combine two events and run them as one event but scoring and results will be separated back out. View/Edit Seeding Pattern — Click if you wish to use an unusual seeding pattern. It defaults to the standard pattern; for instance a 6 lane pool would seed 3,4,2,5,1,6. Scratch Pad by ATHLETE/EVENT — Scratch (or un-scratch) athletes more easily from events prior to reseeding and printing your final copies of the heat sheets. Use Scratch Pad ONLY if an event has not started. Click either button, check mark the athlete(s) to scratch and Exit. You do not need to reseed if you have already created your heat sheets, etc. These scratched athletes will simply not show. You will need to decide, before final seeding, whether to accept each bonus athlete imported from SwimOffice that will be denoted with a check in the BONUS ENTRY box. Select the BONUS SWIM check box if you are approving this athlete for this event as a bonus swimmer. If you do not, they will not be included in the meet. You may check the Seed BONUS swimmers after others checkbox when seeding to ensure they are seeding after non-bonus athletes. 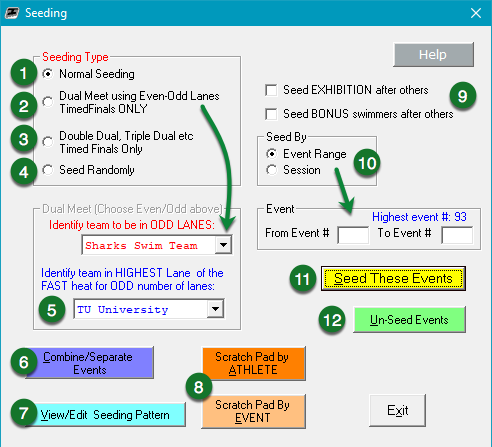 Seed EXHIBITION/BONUS swimmers after others — Select these options to seed the bonus and/or exhibition swimmers (selected in the scratch pad) of their respective events last. Exhibition swimmers may swim but do not score points and may not qualify for finals. Seed By — Select Event Range to then enter the starting and ending event numbers in the Event group below. Select Session to then select all the events in a session from the Session dropdown below. Seed These Events — Seed all the events in either the selected starting/ending event numbers or session. Do not reseed after printing the final heat sheets. Un-Seed Events — Un-seed the selected event range or session to allow changes before final heat sheet printing. NOTE: If you are scratching distance events with positive check ins we suggest you reseed just those events. IF the meet has already started, you must use the Enter Results screen to scratch athletes. Use the SCR notation and do not reseed the meet. ONCE YOU HAVE PRINTED YOUR FINAL COPY OF THE HEAT SHEETS DO NOT RESEED ANY EVENTS AS YOU WILL THEN HAVE DISAGREEMENT BETWEEN THE HEAT SHEETS AND THE PROGRAM. You may reseed events any number of times as you do your meet entries. One way to check for entry errors is to print a PSYCH SHEET (prints a list of athletes in time order for each event rather than in heat) since incorrect times stand out much more clearly on this report. After finalizing your heat sheets, all further changes should be made on the Enter Results screen where you can insert, remove and move athletes easily.